It was a very pleasant space opera and a nice beginning of a series. I was even more impressed when I found out the author is actually a pen name of a joint venture of Daniel Abraham, writer of The Dagger and the Coin series, and Ty Franck, George R.R. Martin’s former assistant and science fiction writer. These two can write and they do it well but the fact that this novel has two POVs helped a bit, I suppose – allegedly Franck wrote the chapters following Holden and Abraham wrote the ones following Miller. Abraham focused on the prose and filling in the details regarding characters and Franck focused on the world building and the plot. Overall the book, even if long, was hard to put down and I was so pleased that the ending was rather conclusive, not one of those ugly cliffhangers that plague some series. Ironically, I think I am going to continue reading because now I’d like to know more. A stand-alone novel beginning a series. If you like sci-fi and space operas with a dash of good, classic whodunnit thrown in and a nice romantic story arc too, do give this one a try. 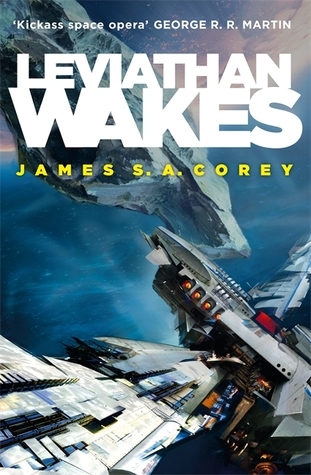 This entry was posted in adventure, book review, crime, sci-fi, space opera and tagged better than expected, james s.a. corey, series alert, space opera, two authors. Bookmark the permalink. Omg, I might even do that!